This pilot project investigated the potential application of Yale Framework analyses and approaches for public land management; where natural resource assessment aims to provide context and information for planning decisions. 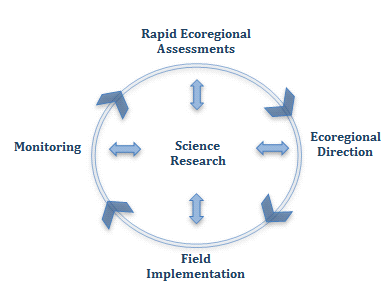 The project built upon a project carried out for the Department of Interior, Bureau of Land Management’s (BLM) Rapid Ecoregional Assessments (REAs — see process diagram below) within the ecological transition between the Mojave Desert and Great Basin ecoregions of southern Nevada. An adaptive management approach is essential with a changing climate. Change is likely to accelerate and bring increasing levels of uncertainty to decision making. We now face the challenge of aligning assessment and planning processes to better foresee rapidly changing conditions and provide insights into the type, location, and timeframe for appropriate management action. The latter factor, - timeframes - tend to differ for assessment vs. planning. Timeframes for ecoregional assessments pertain to the prior century, current conditions, and forecasts extending over the coming 50 years. In contrast, planning decisions are taken within 1, 5, 10, or perhaps 15 year planning cycles. Therefore, a key challenge is to glean insights from assessments organized around longer timeframes that will inform the planning decisions of the coming decade. Determining which actions to take today, versus postponing them for subsequent cycles of assessment, will become an increasingly critical facet of natural resource management in the 21st century. Through this project, we aimed to explore these questions and test analyses suggested by the Yale Framework in order to assist BLM with their planning decisions.